Yes, I went there. I played a Venerable Dreadnaught team. I hadn’t done it before, and if you own the card you have to do it at least once. There he is. Get him out with enough other characters and I can do a lot of damage before my opponent can assign blockers. That means I should get some unblocked characters through. I decided to lean on abilities that buffed all of my characters, to maximize the damage. I also ran the Poxwalker that gets +1A for each other Poxwalker die in the Field Zone, and the Ork Boy that gets +1A if at least one other die also attacks. BACs were Instant War – to give me a means to force my opponent to field Sidekicks for my Plague Marines to target – and Seething Corruption. 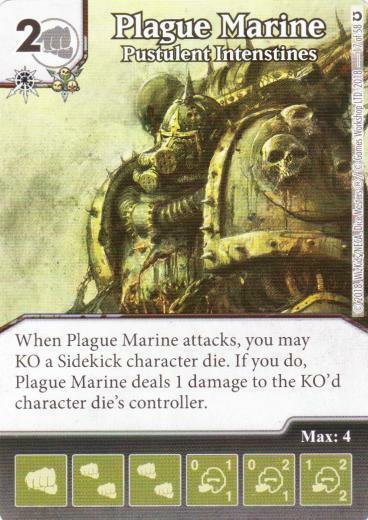 Using the latter before attacking should allow me to wipe my opponents field if Dreadnaught is active. This was against our group’s youngster. She was running a 2-cost Jane Foster (with only a couple of dice) and nothing else that cost less than 4. One of the other cards was a (not She-)Hulk from the Thor set with the buff global. Since I wasn’t buying those, I was buying more dice on my cheap characters. Apart from Jane Foster, my opponent didn’t really have any cheap characters to buy. So I ended up with more characters in my field than she had in hers quite quickly. I’d attack, and something would get through. Now my build was skewed towards cheap fists, and the buff global on her Hulk was a fist global. I ended up using that global quite a bit. It wore her down quite quickly, to the point where I could bull rush her to deliver the coup de grace. This was a Poxwalker Misdirection team. 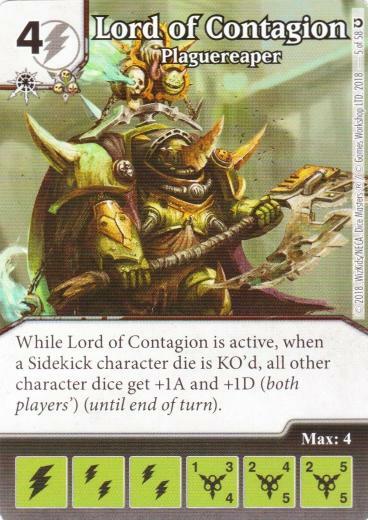 Attack with a lone, unblockable Poxwalker than in the global/action die window of the Attack Step, use Misdirection to swap in something with a bit more punch. This sounds familiar, somehow. His choice for the Swap In character? Goblin Attack Force from Yu-Gi-Oh. A solid choice. Cheap enough he can buy multiples, but packing a respectable punch on all levels. Considering I was familiar with the idea behind the team, I should have thought to buy at least some of the Misdirection dice, but I didn’t, at least not in time. So he kept hitting me with unblockable Goblins. I got Dreadnaught out, did him some damage and forced him to keep refielding Poxwalkers, but the latter was hardly an insurmountable burden. Knowing he was set up to win on his next turn (barring dreadfully bad die rolls) I launched a desperation attack that got him down to 3 life but left my field empty, giving hm the win. Tabaxi Rogue with Heist and Instant War to force me to draw dice. Rounded out with various W40K cards. I got Dreadnaught out and kept KOing Tabaxi Rogue with Range damage. He eventually got a Malignant Plaguecaster out, KOing my Dreadnaught and some other characters. Dreadnaught not only came back on my next turn, it came back at Level 3, making it immune from further Plaguecaster shenanigans. With that settled, I got Lord of Contagion and some Plague Marines into my field, enabling enough of a chain reaction to give me the win. 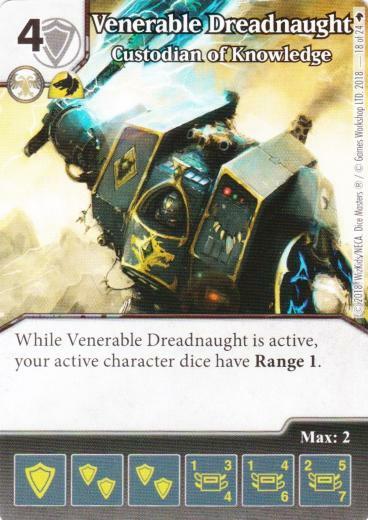 Range is fun, and Venerable Dreadnaught is really fun. It helps a lot once you have the details straight – I was briefly confused, thinking only my attacking dice could use Range while it’s actually if one or more dice with Range are assigned to attack, every character with Range uses it. Venerable Dreadnaught: Custodian of Knowledge seems overpowered for its cost, to be honest. Overpowered enough that I’m actually wondering if it might end up getting banned from Modern in the next rotation announcement. Say, Half-Elf Bard was only ever banned from Modern, not Golden, right? How nasty would it be combined with Dreadnaught? But, do I want to be THAT guy?